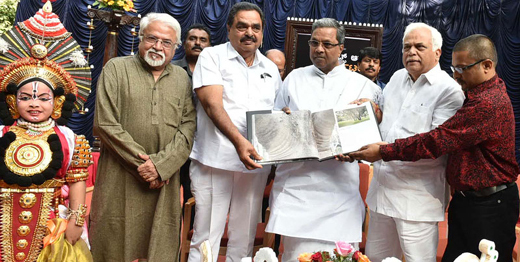 Mangaluru, 15 May 2015: Chief Minister Siddaramaiah released Bengaluru based freelance photographer Keshav Vitla’s coffee table book of over 400 photographs — Facets of Karnataka – A Pictorial Journey , in Chithrakala Parishath in Bengaluru on 14 May 2015. Vitla’s Facets of Karnataka takes you through the nooks and crannies of Karnataka, focussing on its abundant water bodies and quixotic rock formations. Trekkers and weekend bikers may be very familiar with some of these places featured in Facets of Karnataka – A Pictorial Journey, but they have kept them secret and pristine. 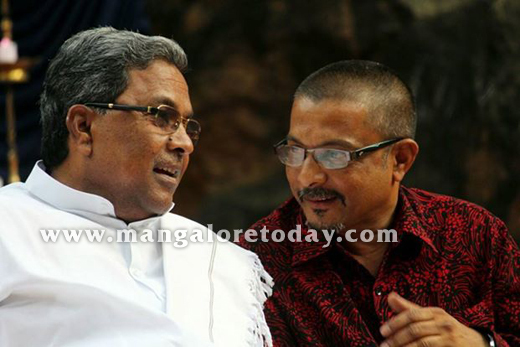 Keshav Vitla, hails from Vitla town in Bantwal taluka, who earlier worked for Mungaru in Mangalore and later joined Indian Express in Bengaluru. For the last one decade he has been working independently contributing to national and international publications and websites. After releasing the book Siddaramaiah said that there is proposal to establish a museum photographs in Bengaluru. Tourism minister assured that his department will buy 100 copies of Keshav Vitla’s book. Keshav too doesn’t really give much away in his book, except his view of some breathtaking sights, and little nuggets of where you can find these beautiful spots. Uttara Kannada features predominantly in the book. Why? “That’s simply where a lot of the beauty is…” he laughs. Not a man of many words, Keshav recounts how the journey of the book really began over a decade ago when he did a series on waterscapes for the tourism department; photographing rocks has always been a passion. “My whole idea with this book was DIE – documentation, information and education. Living here in Bengaluru we are just obsessed with our lives. You go out there and see for yourself how others live. 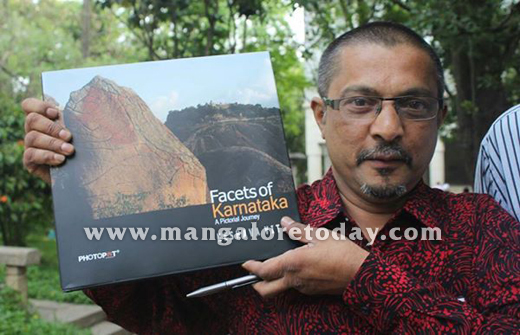 I want to show Karnataka’s nature to the world,” says the 54-year-old. Going in alphabetical order, Keshav has featured around 125 places across the 272 colourful pages in this well-produced book. Shiny, smooth, striated, solitary and rising to the sky – the kind of rocks captured through the lens are many. Bird sanctuaries across the state also feature in all their feathered glory. Panoramic views of hills and valleys predominate the book, as do images of rock and water at play with each other — be it in dams, on riversides filled with shells, or along the beach shoreline. “Rock and water are inter-related. Only if there is stone along the course of a river, will there be a waterfall. Jog is not just about the waterfall; it’s also about the beautiful rock formations. “I went to Godchinmalki falls, near Gokak thrice because it has water 365 days a year — to capture the place in its various phases. Each phase has its own beauty.” A photo-journalist with over three decades of experience, Keshav also talks of his transition from news to travel photography.